From cool classic to ultra chic. This cardigan celebrates your penchant for polish and makes sure you transition to the next season, stylishly. I bought this sweater in Mandarin size S after receiving the matching tank and FlatterFit TS in Canvas. The outfit is stunning and Ive added the Canvas color knit skirt to the collection. I bought all in size S and a 6 in the pant. Fit is true to size if not a bit generous. For reference, Im 55, 127 lbs, 35.5-29-35.75.Great wardrobe for travel when you need nicer items! Stunning with the matching tank. True to size. Style is terrific. I ordered the cardigan and the matching tank. I am very pleased!! As usual, Marlas clothing is top notch. I will wear these with the cuffed pants for a wow outfit!! The fabric is beautiful as is construction. Just what I expect from Marla. But on my TV the Mandarin looked bright orange, which I would have loved. But it is a rusty orange which I don't care for. Luckily I will take advantage of the free exchange on colors. 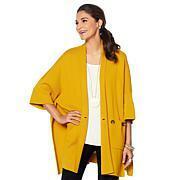 ModernSoul Open-Front Pieced Dolman Sleeve Cardigan Your lifestyle just got easier. This brand gets down to the soul of who you are by creating modern, everyday essentials that layer and mix and match for practical year-round style.